Designer Christian Siriano launched his eponymous collection in 2008 following his studies in London under Vivienne Westwood and Alexander McQueen. The Christian Siriano collection is now shown each season at New York Fashion Week, and presented in New York and Paris to retailers. Known for whimsical and show-stopping design – from fantasy evening gowns and cocktail dresses, to tailored sportswear, to intricately detailed shoes and accessories – the collection can be found at Neiman Marcus and other department stores and specialty boutiques around the globe. In 2012, the first flagship Christian Siriano store opened in New York City and his latest retail venture, “The Curated NYC”, is located in the heart of midtown and steps from 5th Avenue and Central Park. In 2013, he was inducted as a member of the Council of Fashion Designers of America (CFDA). Dubbed “the new king of old-school glamour” by Elle, his designs have appeared in countless editorials and have been worn by the world’s leading ladies and remain a red carpet favorite. He released a photographic retrospective with Rizzoli Books in late 2017, titled Dresses to Dream About, which has now gone into its second printing. 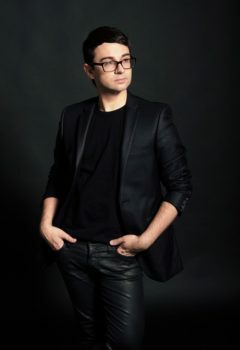 In April 2018, Siriano was named among Time’s 100 Most Influential People in the World for being a pioneer in body positivity and runway diversity in the fashion industry. Having traveled the world over, Christian loves to return home to his two dogs, Topper and Bear, who remain his most prized possessions.